A Democratic senator who banned Syrian refugees as governor called Donald Trump's executive order bigoted. Sen. Maggie Hassan (D., N.H.) was one of 31 governors to ban Syrian refugees from settling in their states in 2015. Hassan, in the midst of challenging incumbent Republican Sen. Kelly Ayotte, said that blocking refugees from the Middle East would help keep New Hampshire residents safe. "The governor believes that the federal government should halt acceptance of refugees from Syria until intelligence and defense officials can assure that the process for vetting all refugees, including those from Syria, is as strong as possible to ensure the safety of the American people,’’ Hassan spokesman William Hinkle said in 2015. Hassan was the only Democratic governor to issue a formal ban on refugees from war-torn Syria during that time. She received major opposition form liberal pressure groups and Democratic candidates, including Colin Van Ostern, the Democratic nominee who launched a failed bid to succeed Hassan. "The best way to protect the security and liberty of the people of New Hampshire is through expanding the extensive person-by-person security and safety screening process that the United States requires today for every refugee—not by adopting a new blanket ban against one nationality or religion that plays into the hands of the ISIS terrorists while giving us a false sense of security," Van Ostern told the New Hampshire Union Leader in a statement. Hassan has changed her approach to refugees and immigration since taking office in the Senate. She has attacked the Trump administration for his temporary ban on immigrants from seven countries that are majority Muslim. Hassan did not respond to request for comment regarding her about face on the issue. "President Trump's executive action imposing a religious test on refugees runs counter to our American values. It also makes us less safe," Hassan said on Twitter. "I will also work in Congress to override this executive action." President Trump's executive action imposing a religious test on refugees runs counter to our American values. It also makes us less safe. I will also work in Congress to override this executive action. Hassan added that she would work with Sen. John McCain (R., Ariz.) to help grant visas to interpreters who have assisted American troops in Afghanistan and Iraq. "It's also disgraceful that these executive actions would turn away brave men & women who have risked their lives to serve as interpreters," she said. Both groups would be banned from immigrating to the United States under the executive order signed by Trump on Friday. 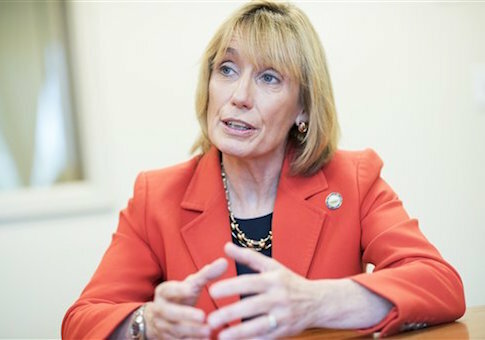 The head of the New Hampshire Republican Party, Jeanie Forrester, said that Hassan has switched her position in order to curry favor with the national Democratic Party and its base. Forrester criticized Hassan for placing "partisan politics" over defending the nation. "Maggie Hassan was elected in part by publicly supporting a ban on Syrian refugees," Forrester said in a statement to the Washington Free Beacon. "She's been in Washington just a few short weeks and already she's flip-flopping. Maggie Hassan should put national security ahead of partisan politics." This entry was posted in Politics and tagged Maggie Hassan, Trump Administration. Bookmark the permalink.